Annie Daly—When you think of Machu Picchu, Peru, you probably think of old ruins, beautiful views, and… dirt. Lots of dirt. That’s because the typical Machu Picchu experience involves hiking the Inca Trail and camping along the way, which takes four or five days total. But while camping is great—big props to those who do it—there are other ways to see the famous ancient ruins that don’t involve sleeping on the ground and putting your hygiene on the back burner. Here, five (cleaner) alternatives. 1. You can stay in lodges along the Inca Trail. The eco-tourism company Mountain Lodges of Peru offers the Salkantay Journey, a lodge-to-lodge trek along the Salkantay Inca Trail that takes you to the legendary Inca ruins. Led by a personal guide for the duration of the trip, hikers stay in four deluxe lodges on the five-day journey, which ends at Peru’s golden child, Machu Picchu itself. Adventurers hike anywhere from three to seven hours per day, through nine biozones and 15 ecosystems, including a lush rainforest and a beautiful glacier lake. There’s also plenty of culture to experience along the way, as many local natives are more than willing to share their traditions and ideas with those passing through on their journeys. And as for the lodges themselves? One word: deluxe. All four of them are inspired by traditional Inca architecture and feature fine dining, good wine, massage services, and Jacuzzis. You know, your basic provisions for living the dream. Conclusion: If you choose to travel the Inca Trail lodge style, you are in for a cozy and luxurious treat at the beginning and end of each day. 2. You can stay in lodges along the Lares Trail. The what trail? Isn’t Machu Picchu all about the Inca Trail? Not necessarily. Though that’s the most famous one, there are also lesser-known trails — and Mountain Lodges of Peru has just launched a new adventure trip on one of them, the Lares Trail. The Lares Adventure is led by a personal guide for the duration of the trip, which you can do in either four nights or six nights. You trail hop from two new lodges, each of which serves as a “base camp” for day hikes. One of the new lodges is in Lamay, and the other is in the small, rural community of Huacahuasi — but both are deluxe. Fireplaces, gourmet dining and even a Jacuzzi and massage studio make them perfect for settling in after a long day of hiking and exploring. 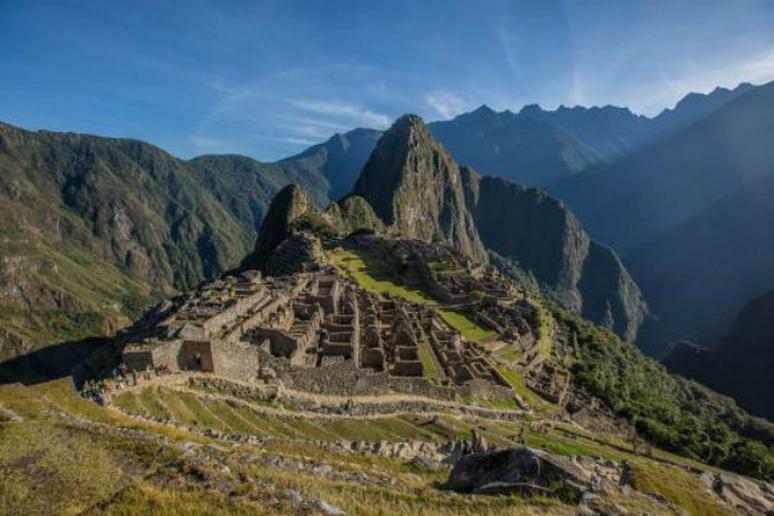 The adventure concludes with a guided tour of Machu Picchu itself. So, why the Lares Trail instead of the Inca Trail? The main reason that Mountain Lodges of Peru created this new adventure is to provide an alternative to the highly traveled Inca Trail. But perhaps more specifically, the Lares Trail is known for its cultural attractions. Travelers can check out local traditional weavers all decked out in cultural dress, plus tons of glacier lakes, waterfalls, and snow peaks, before reaching the legendary ruins of Machu Picchu itself. In other words, the new Lares Adventure is designed to be a bit less strenuous and a bit more cultural than the traditional trek to Machu Picchu. Who needs hiking when you can fly? Kidding… kind of. The company Amazing Peru offers hour-long flight tours right over the Sacred Valley of the Incas. As long as you are OK with riding in a small plane, then this could be a fun way to see the ruins without making the actual trek. The plane fits a minimum of eight passengers, and it can also be chartered. Passengers fly over Tipon and Pikillaqta, both archaeological sites, Pisaq and the Urubamba Valley, Sacsayhuaman, and, of course, Machu Picchu itself. Flights cost $400 for 40 minutes and can be longer or shorter as requested. Or, alternatively, you can arrange for a helicopter ride right over the ruins. 4. You can Om your way through Machu Picchu. Machu Picchu is known as one of the most spiritual lands in the world, so why not go all out and Om your way through its ruins? Amazing Peru offers a seven-day yoga tour where visitors travel from Lima to Cuzco and finally to Machu Picchu, where they stay in the famed sanctuary Lodge hotel right outside of the ruins. They participate in multiple meditation and yoga sessions throughout the trip, but the highlight is a private session smack-dab in the middle of the ruins. Now that is an Om experience worth waiting for. 5. You can travel to Machu Picchu by horse. Yes, horse! Mountain Lodges of Peru offers a horse adventure along the Salkantay Trail for intermediate riders. Adventurers ride through the beautiful scenery for at least four hours a day and have the option to stop for other activities as well, including ziplining and hiking. Each day ends at one of the four deluxe and incredibly cozy lodges (the same ones as on the straight hiking tour). And after a full day of horseback riding through the mountains, the amenities will feel extra amazing! So there you have it. Machu Picchu isn’t just about making the camping trek—there are many other ways to get to the ruins in style.